Our tubular A-arms are constructed out of .156"-wall tubing, with 7/8"-diameter arms. The billet, eyebolt-style adjuster in the upper A-arms greatly simplifies suspension alignment and cannot come loose like the slotted-style, OEM adjusters. Our billet bushing mounts are stronger and look better than the tubular bushing mounts used by all other manufacturers. The threaded balljoint housings have a profiled groove on their outside diameters to enhance the appearance, and feature dust-boot counter-bores to provide a better balljoint seal. 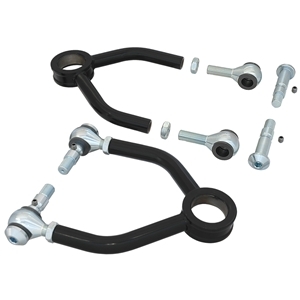 The screw-in balljoints are sold in pairs with the dust boots, and must be purchased separately. Optional, polished-stainless balljoint covers screw onto the top of the balljoints and greatly improve their appearance (sold in pairs). Billet eyebolts, bushings and pivot pins are included. Chassisworks' exclusive billet pivot studs have taper-formed heads and provide the correct bushing preload; set-screw grooves assure they will not come loose. These A-arms are constructed out of mild steel and are black powder coated.